As we have witnessed the injuries of Kelvin Benjamin and Jordy Nelson, it has served as a friendly reminder that the later you draft, the better. Ideally, you want to wait until at least the second round of preseason games in order to take account early injuries and depth chart movement. By the end of this weekend all attention will be placed on week 1 and draft boards will be finalized. Taking all this into account, I decided to place my rankings out ahead of the game. You will notice that my rankings differ from most, but with good reason. I look hard into the 3-year averages and do not account for touchdowns. Touchdowns are a bonus and something you cannot count on with consistency. All of these rankings are based on a 10 Team PPR league with a scoring system of 6pts per TD (passing,rushing, or receiving), 1pt per 10 yards rushing/receiving and 1pt per 20 yards passing. I will be posting every few days by position with today being Quarterbacks. If you do not see a player listed it means they have hit the wall of irrelevancy. Please leave your comments and opinions here, the FB page or on Twitter…..
Andrew Luck 2014 Fantasy Player of the Year……More Weapons this year makes him just as valuable. 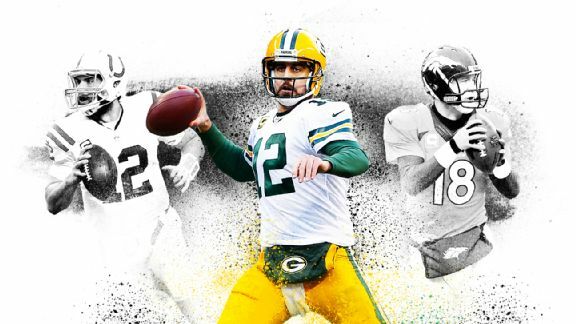 Aaron Rodgers Rodgers is the ultimate field general and has an offense built around him. Jordy Nelson has been lost with an ACL, but Eddie Lacy has just come into form. Peyton Manning Rumors of declining arm strength were concerning, but new head coach Gary Kubiak will bring a new commitment to the run and take the attention off one of the games greatest players. Drew Brees Brees passed for a silent 4,952 yards last year and shall have no problem attempting over 500 passes and eclipsing 30 TD’s….He’s still got it! Russell Wilson 2014 Breakout year with 849 yds rushing. Add now a receiving threat like Jimmy Graham, we could be talking huge year in 2015! Ben Roethlisberger Back to Back 4,000+ years and a very young offensive core all adds up to another big season for Big Ben. Tom Brady Suspension or not, this guy remains top QB. 33TD’s and only 9 Int’s are quality numbers for your starting QB. Matt Ryan Very underrated QB who has a chance to finish in the Top 3. Close to 4700 yds last year and a stud like Julio Jones bodes well for the lead Falcon. Tony Romo He was protected by a great running game and great o-line. Can he repeat without Murray? His back is as fragile as a rebuilt fossil, so protection is a must! Matthew Stafford Inconsistent is the mark of his career. It’s like riding a wicked roller coaster that never ends. Eli Manning Quietly had an excellent season. Beckham and Cruz could equal big numbers for Peyton’s baby brother. Cam Newton The man with the S on his chest will have to save the world. Kelvin Benjamin goes down for the year and now it all rests on Cam. Ryan Tannehill Came on strong last year. Has improved by 10% each of his 3 years. This is a QB1 in the making. Philip Rivers New Extension, new security. Rivers is as steady as they come. Put him in and let him produce. Sam Bradford If he stays healthy a line of 4500 yds and 30 TD’s is not far off base. Healthy is the big question? Teddy Bridgewater This guy has the chance to be special. A healthy AP and nice young WR core could rise him into the Top 10 by season’s end. Derek Carr Really like what Oakland is doing and Carr has a real chance to be consistently productive. Andy Dalton If you gave Tom Brady receivers like Green and Sano the sky would be the limit. Just saying. Colin Kapernick This guy has all the tools, but how many years are we going to wait for him to use them? Jay Cutler New Front Office, New Coaches….Can anyone help Jay? His stats go up and down more than the stock market. Carson Palmer ACL comeback story of the year? Good training camp, but still on the wrong side of 30. Joe Flacco Calm, Cool and Consistent. Ever seen this guy rattled? Nick Foles Can he repeat what he did in 2013? You may have a better chance of seeing Geno Smith in Celebrity Death-match. Marcus Mariota Has a chance to produce some really good games. Could be talking about him as a QB1 in 2016. RGIII Best in the Game? C’mon Robert….Sounds like someone has been hanging out with Ricky Williams in the off-season. ***Come follow me on Twitter (@TCutillo23) and my sports site fantasysportsaddiction.com and all my daily posts on the Extreme Sports Addicts FB Fan Page (Click the like button at the right of this page)…Come join in and let your presence be felt! Next Next post: Has the Shake-up in the Divas Division Really Been a Revolution?